Let me first start off by saying that this week felt like it dragged, but I still can't believe it's Friday, if that makes any sense! Since we're finally at the start of the weekend, I thought I'd share an outfit idea that's perfect for a pretty casual or empty agenda. As the weather begins to show itself friendly by warming up a bit, I like to strip away the heavy layers and reach for pieces that still provide warmth without the massive bulk and this light cashmere sweater does just that! The first time I wore it (here) I layered, so of course it felt warm, but this time around, I wore it all on it's own and it's still very warm and cozy. This is what I love about cashmere, it's warm and feels so luxurious against the skin, making it a wardrobe essential. 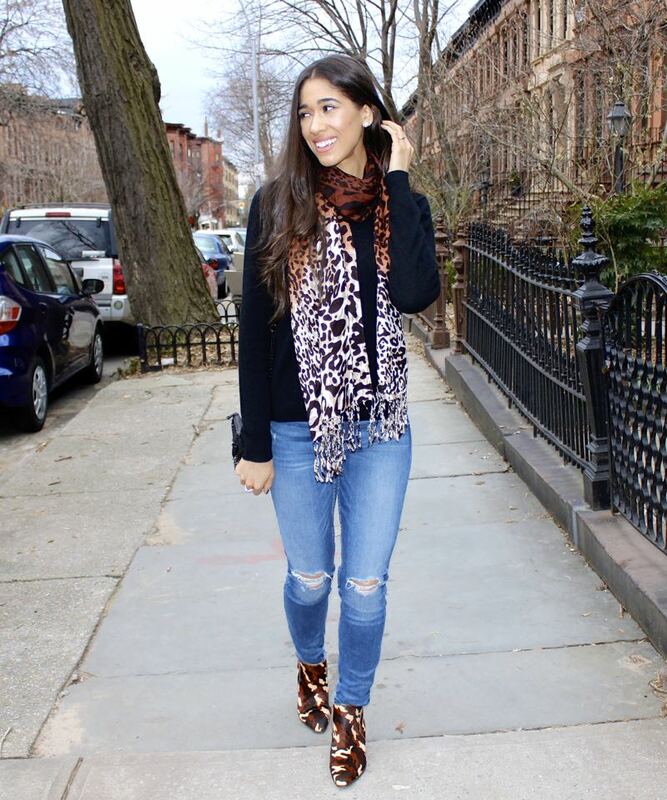 I think a black sweater and distressed jeans are the perfect weekend look for any body shape. Generally speaking for pear shapes, it's usually ideal to highlight the upper body by wearing brighter colors or tops with detail of some sort. 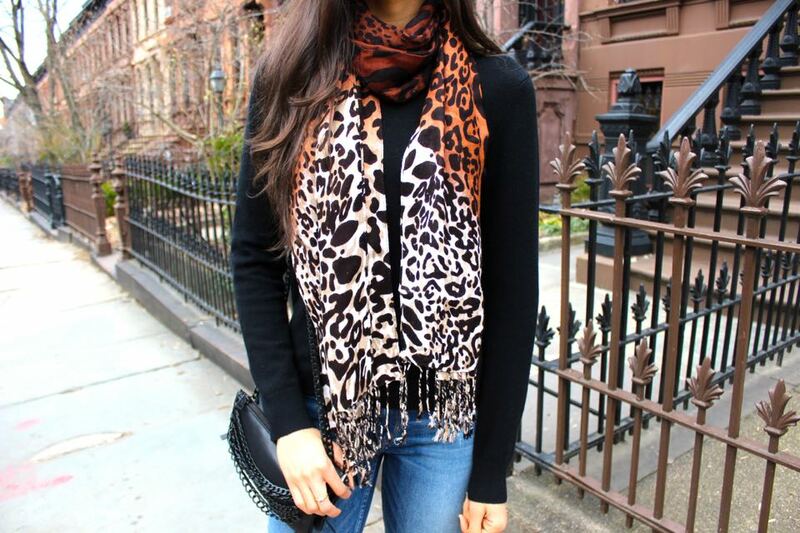 In this case, however, I reached for my leopard printed scarf to help bring attention to the upper body, add some personality as well as additional warmth; that's something you can do as well or perhaps add a nice statement necklace to create a focal point. For my apple shaped ladies, a black sweater paired with distressed jeans can help bring more attention to those fab legs of yours and for my rectangular and hourglass shapes, the attention will be distributed evenly everywhere, since both your shapes are proportional. You see, this look works for everybody! 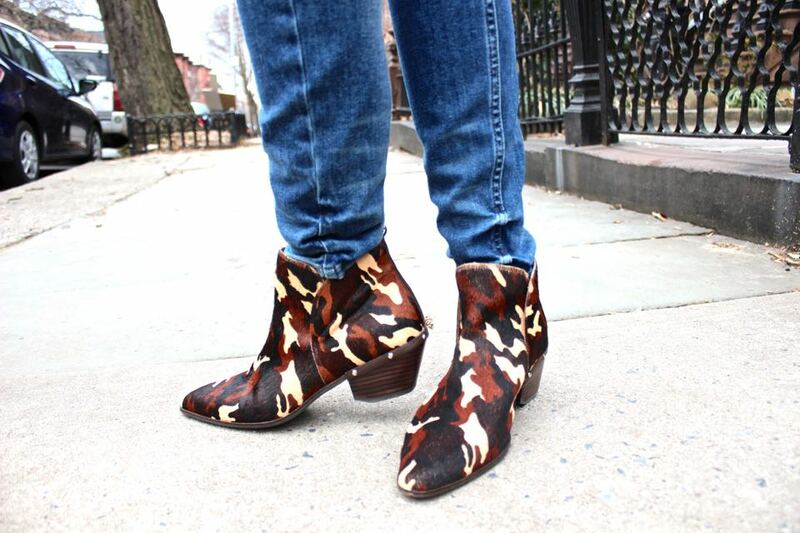 You all know how much I love to pattern mix, so I decided to finish off the look with my camo printed ankle boots. You guys, these are so comfy and go with practically everything; I've been wearing them a lot (here & here)! Every time I wear them, I always get asked about them! They're so different because they're camo print, but they have a leopard print color scheme and they have a cowboy boot shape, but in the form of an ankle boot. Talk about a fun and interesting combination, my kind of shoe! I hope this post inspired you my dear and beautiful friends! 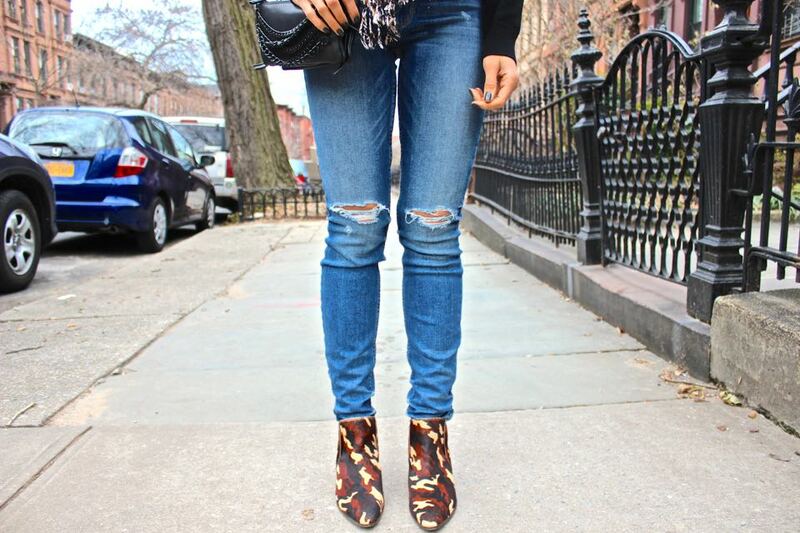 Oh, I also want to mention that if you are a pear shape (like me) and want to recreate this look with distressed jeans, I suggest you pair them with pointed toe shoes or boots to avoid creating too much visual weight that a rounded toe shoe can create (talking from experience ;) Thanks so much for stopping by and I hope you have an amazing weekend! Next: How to Wear the Canadian Tux for Your Body Shape Previous: How to Achieve a Slimmer Face Without Contouring!